, we're entirely unsurprised to see RIM's software roadmap apparently hit the net. 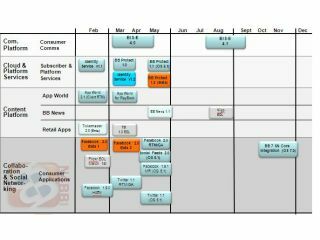 BlackBerry-themed blog N4BB claims that it has got its hand on the roadmap for the year, which lists BlackBerry 7 around the October/November mark. There isn't much else listed in the second half of the year, which suggests that either this isn't an official or finished document, or RIM is going to be putting all its eggs in the BlackBerry 7 basket. Could BlackBerry OS 7 be the QNX-based software that RIM has promised will make the leap from PlayBook to smartphone? Let's hope so; this could also see BlackBerry phones starting to get access to Android apps, should RIM's rumoured experimentations with the Google OSes applications ever come to fruition. Let's not get our hopes up too high though; there's no guarantee this is an official roadmap, no guarantee there won't be delays and no guarantee that BlackBerry 7 will be rolled out in the latter part of the year even if it is revealed.